If you're like me, you're always on the hunt for a fun and festive Valentine's Day project. Today, I thought I'd share two FREE lessons that you can combine to make two different types of projects. I've teamed up with my friend, Art with Jenny K.. to tell you all about them! 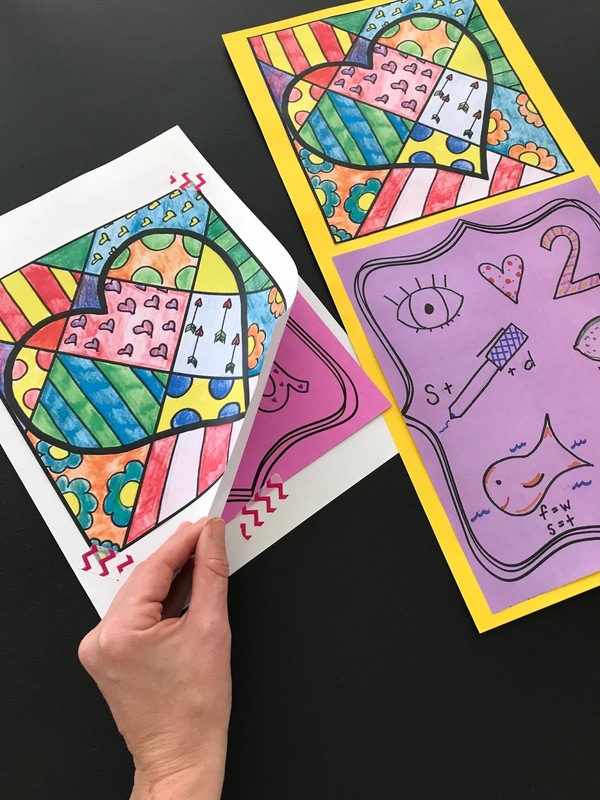 Start both of these projects with the pop art heart designed by Art with Jenny K.
Students will need to add patterns and designs inside the shapes of the heart. 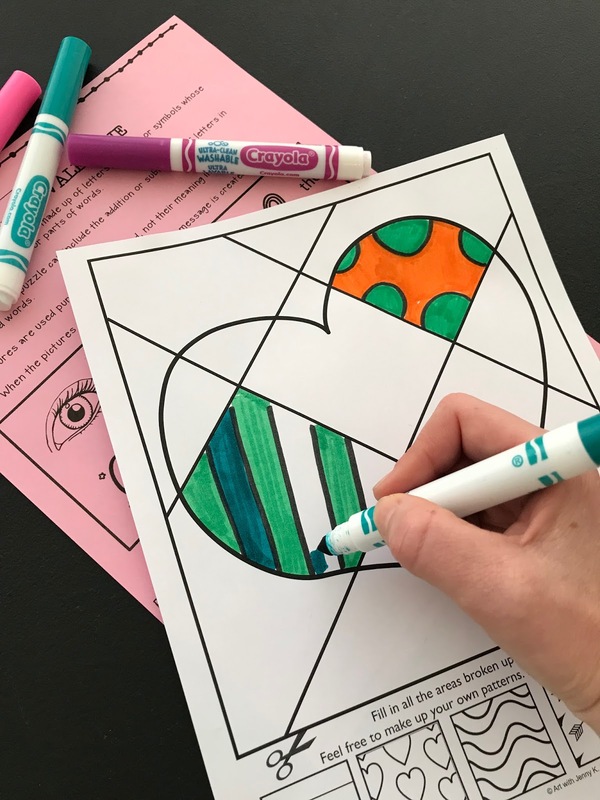 Then, they can color in their patterns to make a unique Valentine heart. 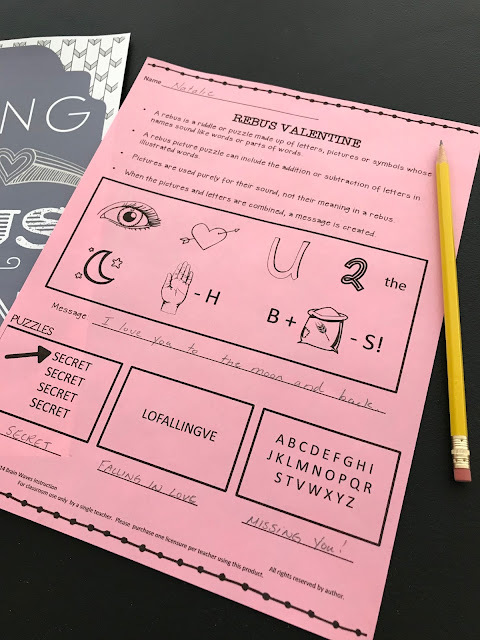 Next, get students working on creating and writing a rebus valentine. Students will learn all about the rebus style of writing. Then, they'll solve sample riddles before they brainstorm some ideas of their own. Finally, they'll create their own Valentine message in the rebus-style of writing. They should write their message on the final copy paper provided. 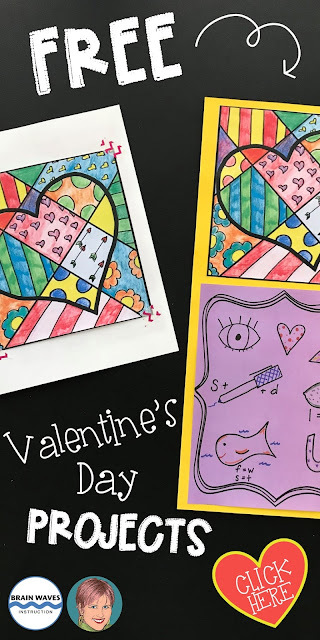 After students have finished their pop art heart and rebus valentine, it's time to get creative. Students can create two different projects with their work. 1. They can create a jumbo Valentine's Day card. 2. Or, they can make a long Valentine's Day poster to display. Have them fold an 18" x 11" piece of construction paper in half. Then, they can add the pop art to the cover. Inside, they can glue the rebus message. 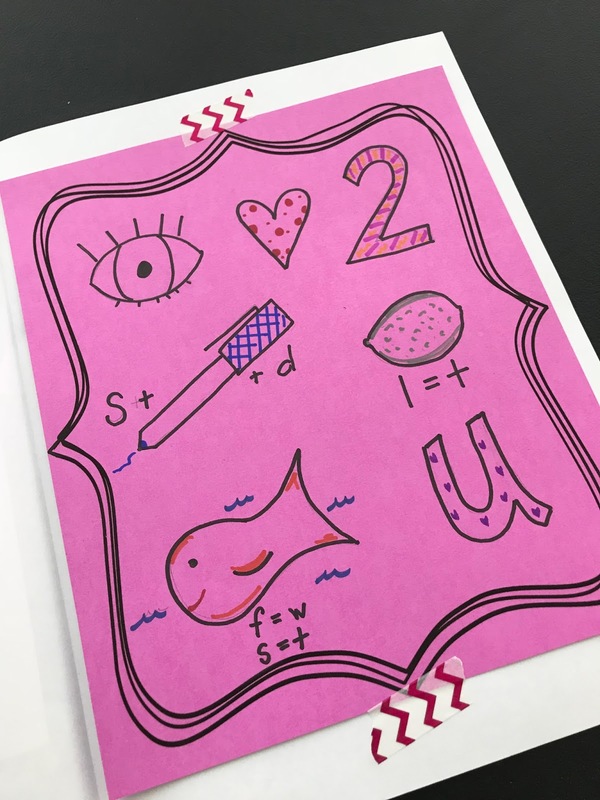 You can "amp" up the valentine with scrapbook paper, stickers, cut-outs, and lots of doodles and drawings. 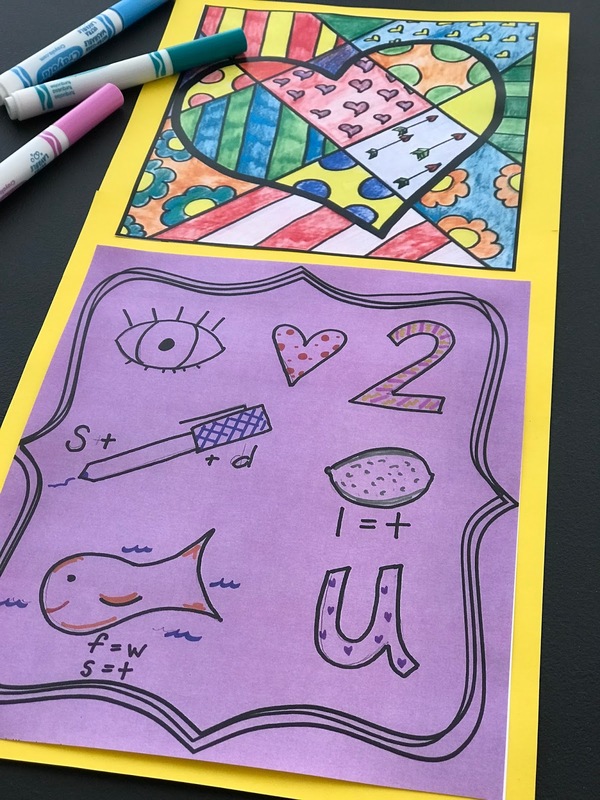 Or, you might have students draw the pop art heart directly on the cover of the card. Or, you might have students create a Valentine's Day poster with the pop art and rebus message. Again, students will need a piece of 18" x 11" paper and their completed work. On a piece of 18" x 11" paper, students can glue their heart and rebus. Both projects make great gifts or classroom displays. 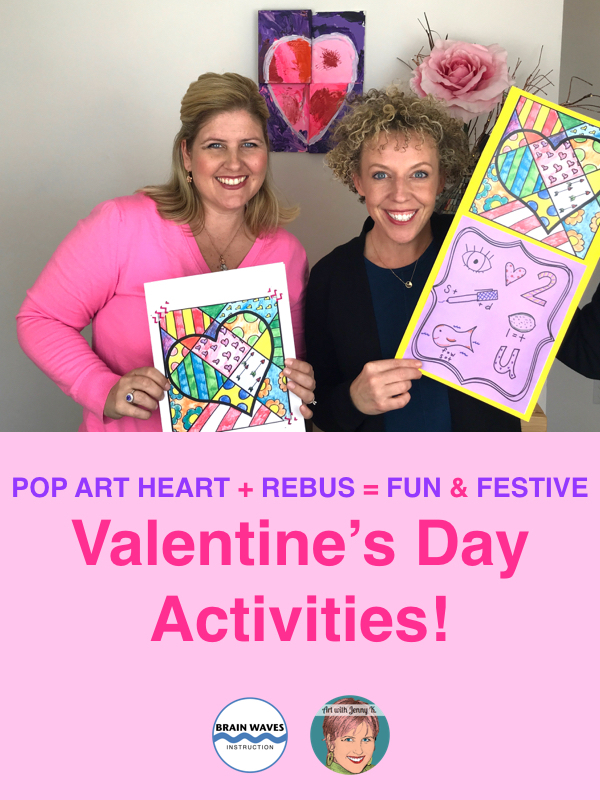 We hope you and your students enjoy combining the pop art hearts and their Valentine's Day rebuses to create fun and festive projects! You can check our video all about these ideas HERE. Students collect 14 facts about Valentine's Day while they learn about its history, traditions around the world, and stats and figures. Then, they turn their learning into a fun doodle infographic. Here's a free set of Valentine's Day gift tags that you can add to school supplies and give to your own students. For a fun twist, check out this video to learn how to turn the tags into stickers! Check out this set of 5 Valentine-themed creative writing lessons. These lessons help students practice skills like figurative language and parts of speech. Students will be able to write creativity all February long! And, when you're ready for a little spring (after Valentine's Day), you might want to check out my favorite set of poetry analysis lessons. 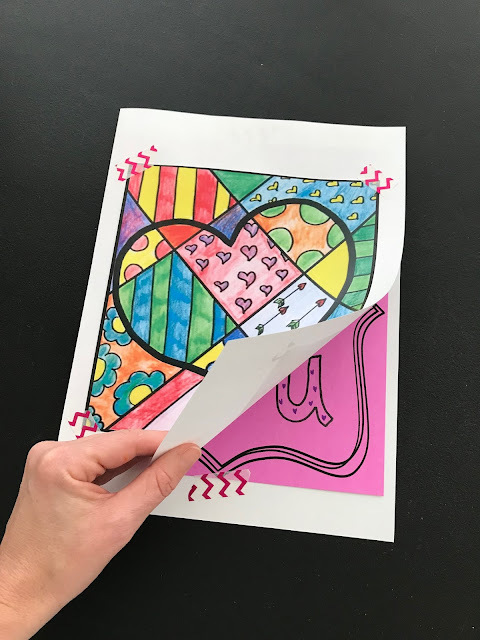 Oh, and if your students fall in love with creating the pop art heart, find a bunch more pop art coloring pages here. Or, combine reading and pop art with this set of Nonfiction Reading Comprehension Passages!